1. St. John’s (Shrewsbury) (8-1; Last Ranking: 2) Only blemish to the Pioneers strong start is a 6-5 loss at Nashoba. They have the pitching and hitting necessary to make another run into the MIAA Division 1A Super 8 Tournament. 2. St. John’s Prep (8-2; Last Ranking - 1) Eagles wound up on the wrong side of a slugfest, suffering an 11-8 loss to conference rival Catholic Memorial. 3. Braintree (7-1; Last Ranking: 3) The Wamps took down BC High at Monan Park to conclude the Challenge to Cure ALS Tournament, and have now won six straight since losing at Brookline on April 6. 4. North Andover (7-0; Last Ranking: 6) Sophomore Sebastian Keane spun a complete-game shutout at Haverhill to preserve the Scarlet Knights undefeated start. 5. Lowell (7-2; Last Ranking: 8) Overall strength of schedule carries the Red Raiders to the fifth spot in our rankings despite a recent loss to rival Methuen. 6. Central Catholic (7-2; Last Ranking: 5) A surprising 7-4 loss to Dracut hurts the Raiders early chances to make the Super 8. 7. Lynn Classical (9-0; Last Ranking: NA) These Spartans are on a mission with nine straight victories to open the season, including a huge conference win over Peabody. 8. Silver Lake (8-2; Last Ranking: 9) Wins over West Springfield, Plymouth North and Bridgewater-Raynham had the Lakers flying high, until they dropped consecutive conference games to Hanover and Whitman-Hanson. 9. Methuen (5-2; Last Ranking: NA) Overcoming narrow losses to Andover and Central Catholic with a narrow win over Billerica and a 6-1 victory over Lowell proves that the Warriors can compete in a loaded MVC this year. 10. Xaverian (5-4; Last Ranking: 16) One of several Catholic Conference teams with a poor overall record but excellent strength of schedule, the Hawks are a couple of runs away from a host of quality wins. 11. Belmont (6-0; Last Ranking: NA) Marauders are off to a great start behind the play of senior Cal Christofori. They’ll visit Reading in a huge Middlesex League tilt to begin the week. 12. 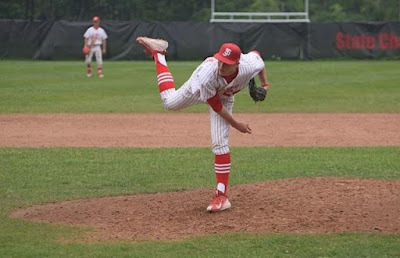 BC High (5-5; Last Ranking: 10) Senior Gavin Reily spun a no-hitter with zero walks to down Malden Catholic, 2-0, and bring the Eagles back to .500 through 10 games. 13. Malden Catholic (6-4; Last Ranking: 15) Yet another Catholic Conference team that is in the mix for Super 8 consideration if they can get hot during the second half. 14. St. Peter-Marian (4-3; Last Ranking: 12) Magicians are playing a very tough schedule and as a result, have suffered three losses to elite team thus far. 15. Whitman-Hanson (6-1; Last Ranking: NA) Undefeated atop the Patriot League Keenan Division, the Panthers have a two-game lead over incumbent powers Plymouth North and Silver Lake. 16. Brookline (7-3; Last Ranking: NA) As the only team to beat Braintree and thus far and the leader of a stacked Bay State Carey Division. 17. Newton North (5-3; Last Ranking: 7) It’s been a very tough start for a young Tigers team, but the talent on the roster combined with the experience of head coach Joe Siciliano should carry them in a stronger second half. 18. Lynnfield (9-0; Last Ranking: 25) The Pioneers won 6-2 at North Reading during vacation week and have a stranglehold on the Cape Ann League Kinney Division with an 8-0 conference record. 19. Middleboro (6-0; Last Ranking: 22) The Sachems offense is on fire with 57 runs scored over six victories. 20. Walpole (5-3; Last Ranking: 4) After edging Xaverian behind a gem from Brian Gaughan Rebels dropped three straight to Franklin, St. John’s Prep and Needham. 21. West Springfield (6-2; Last Ranking: NA) Terriers came up short in their second annual trip to Silver Lake, but earned a big win against Northampton the following week. 22. Peabody (6-2; Last Ranking: 11) The Tanners hot start came to a halt with losses to Everett and Lynn Classical. 23. Catholic Memorial (4-5; Last Ranking: NA) While they only have four wins, the Knights have defeated elite competition in Malden Catholic, Brookline, and hung an absurd 24 runs in wins over Newton North and St. John’s Prep last week. 24. Dighton-Rehoboth (6-2; Last Ranking: 20) Despite dropping consecutive contests to Old Rochester and Somerset-Berkeley, the Eagles remain the class of the South Coast Conference. 25. Reading (4-0; Last Ranking: NA) Rockets are firing on all cylinders behind two-way star Corey DiLoreto and will look to upset Belmont at home this Monday.